As the Cole Porter Song goes, it's too darn hot. The scorching, dry weather continues, with temperatures hitting 34 deg C on some days. 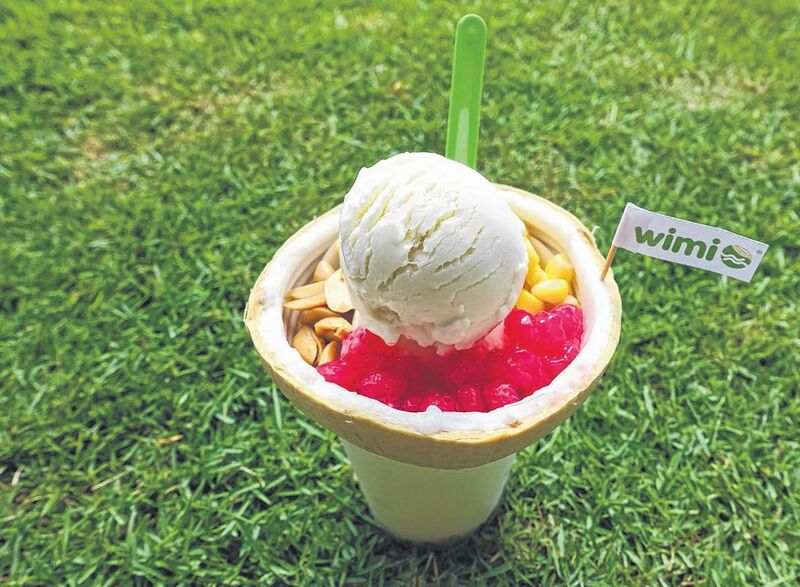 With Singapore sizzling and sweltering, here are 15 food and drinks to help you keep cool. 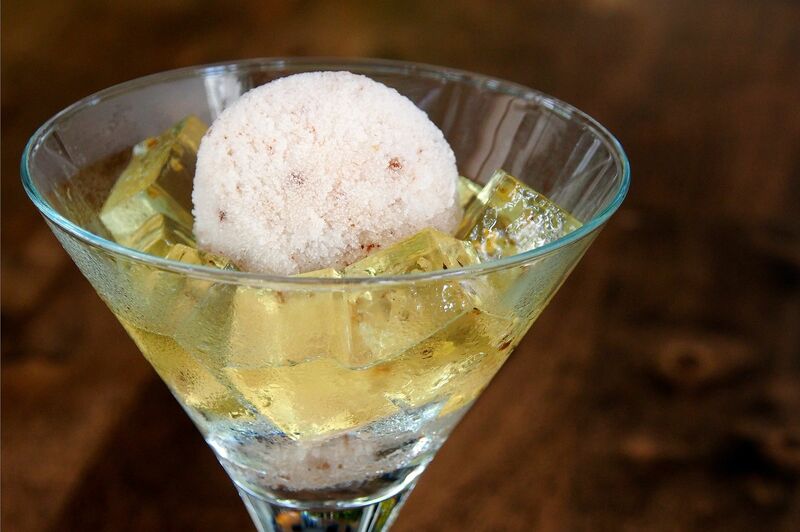 What: Cooling osmanthus and sweet-tart ume meet in this chill-out dessert ($10). The sorbet is made with preserved Japanese plum, but anyone who has grown up in Singapore will immediately think of sng buay (Hokkien for salted plums), a guilty pleasure to be sure. Osmanthus, with its big apricot flavour, is made into a jelly, and I would not have thought to pair it with ume, but they work so well together. Just looking at this dessert cools my fevered brow. What: This Chinese dessert shop has been doing a roaring trade, with office workers packing the place at lunchtime or buying cool desserts to take back to the office. 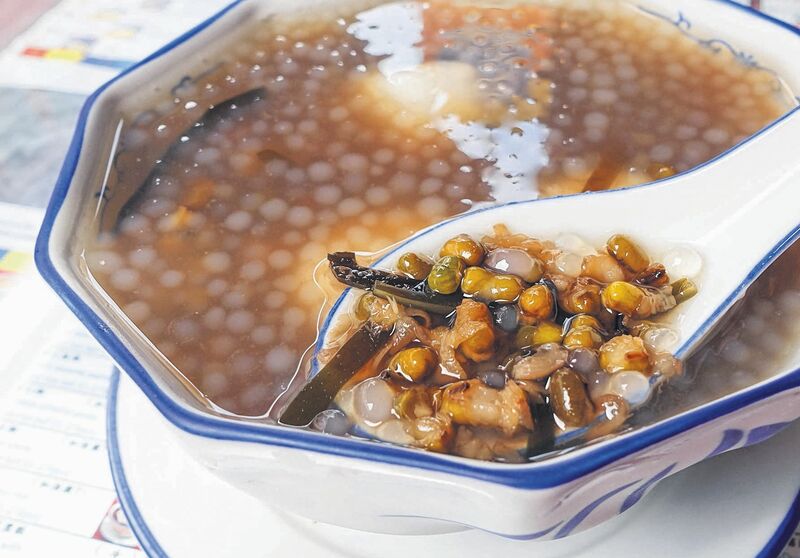 Green bean soup is a traditional cooling dessert and you can get an excellent version of it here, with strips of seaweed and crystal-clear sago pearls ($2.30). Add $1.20 for tang yuan filled with crunchy peanuts. The beans are not cooked to mush. They are tender enough, but retain a bite, which contrasts so delightfully with the springy sago and the gentle crunch of the seaweed. What: The name alone is promising and I just cannot get enough of this brain-freezing drink. 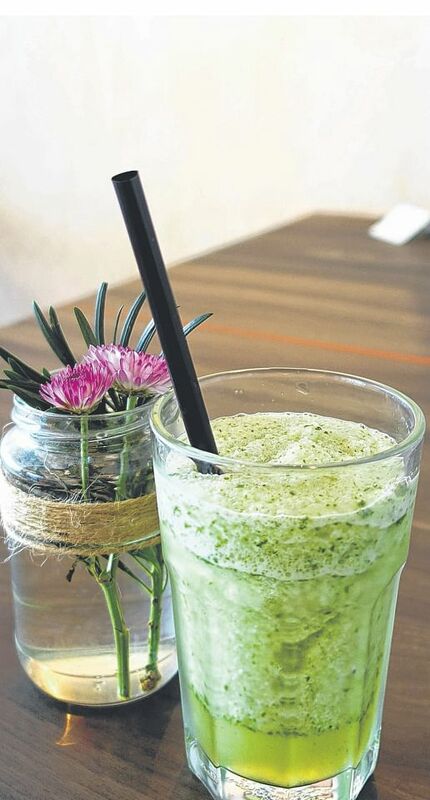 Fragrant elderflower and mint are a great combination, and the iciness of the drink lasts through your meal at this cafe. I always finish every last drop. What: This barely month-old business is named after the owners, Mr Wilson Lim, 28, and Mr Mike Koh, 29. Their little takeaway shop serves coconut ice cream in coconut husks, a popular dessert in Thailand. For $4.90, you get two scoops of ice cream with three toppings and a cup of refreshing coconut water. Here is a dessert that cools a person down instantly. The not- too-sweet ice cream comes in two versions, Original and Stronger, and I recommend the latter. Peanuts and sweet corn are great with the ice cream, and I pay 30 cents extra for red rubies too, made with crunchy water chestnuts. The owners have thought of everything. The coconut flesh is scraped off the husk, so it is easy to get at the sweet, tender strips without breaking the plastic spoon. 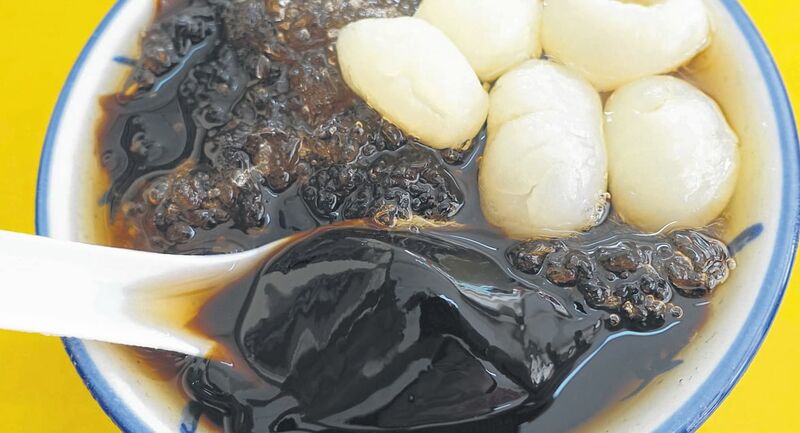 What: Grass jelly or chin chow is yet another traditional cooling food, made with the serrated leaves of the Mesona Chinensis plant, related to mint. At Zhao An Granny Grass Jelly, a basic bowl costs $1.50. Add-ons, which cost 50 cents each, include nata de coco, attap seed, longan and sea coconut strips. For an extra cooling effect, opt for sea coconut, but I cannot resist longan, even though the fruit is known to be heaty. The cooling chin chow will knock that out, I tell myself. What I like about this chin chow is its light herbal taste, virtually undetectable in many versions of the jelly. It is also firm, but with a bit of a wiggle. Each bowl comes showered with crushed ice, for an extra cooling effect. What: The curmudgeonly owner of the stall refuses to give away any secrets and he should not, because in a hawker centre with other stalls selling the same thing, his avocado shake ($2.50) reigns supreme. Aside from avocado and milk, I detect hints of gula melaka. What a creamy, dreamy way to keep cool in a hot hawker centre. The shake is not so thick that it gets stuck in the straw, but not so thin that it has no substance. Most importantly, it tastes of avocado and not the other mysterious ingredients that go into it. What: When it's sizzling and you want to get sozzled, order Watermelon Soju ($38) at Chicken Up, a Korean fried chicken restaurant. It comes with some ceremony. Half a watermelon, hollowed out and filled with watermelon juice, arrives at the table in a bowl with dry ice, so smoke billows everywhere. Pour in the small bottle of soju, distilled alcohol that can be made with rice, wheat, barley, tapioca or potatoes. Then stir and slurp. It is an adult version of a watermelon slushie and gets everyone in the mood to party, even on balmy nights. The only other things you need? Good music and piles of fried chicken. What: I marvel at people who can eat spicy food and tuck into hot pot meals on scorching days. When the thermometer goes way up, I want fresh, crunchy and light food. The Provision Shop's new salad ($12) fits the bill perfectly. 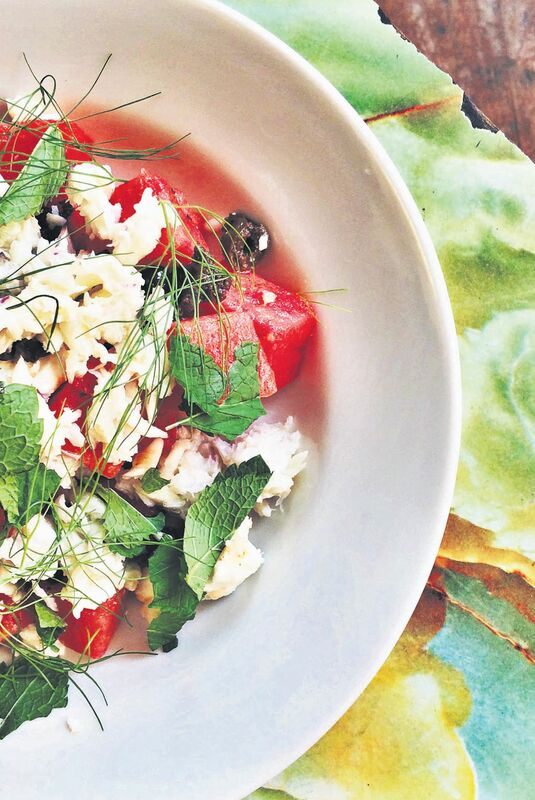 Chunks of sweet watermelon are tossed with blue swimmer crab meat, feta cheese, olives, torn-up mint leaves and fennel fronds, and lightly dressed with a honey and lemon vinaigrette. The balance of salty, sweet and tart is perfect and the bursts of mint add to the cool vibe. Best of all, the salad will not bring on a post-lunch coma. All good, in my books. What: Bittergourd is what the Japanese eat in summer to stay cool, along with eel. Okinawan restaurant Nirai Kanai's Goya Chanpuru ($15.30 for a set meal) is especially good. 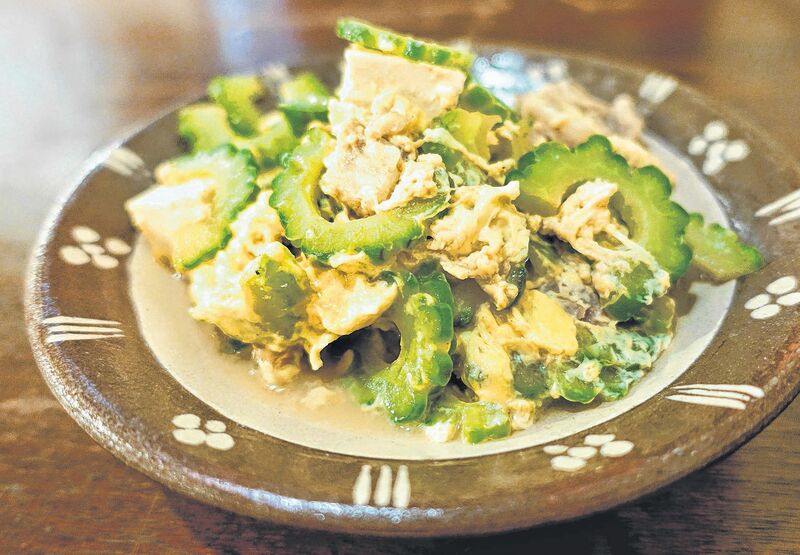 The stirfry is made with good quality Japanese bittergourds, cubes of firm tofu and pieces of pork. It has a homey taste that hits the spot. Perfect with rice. What: There is nothing wrong with local ice kacang, but the Koreans have introduced a most delightful shaved iced dessert to Singapore - bingsu. The ice looks like dessicated coconut, so fine and soft it is. Nunsaram does a really good Green Tea ($13.90) one. 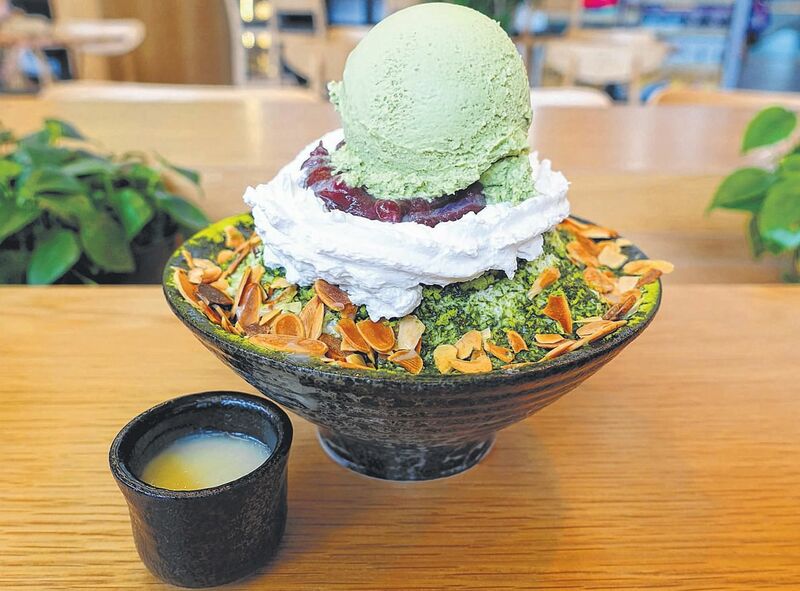 On top of the shaved ice are toasted sliced almonds, sweet red bean, whipped cream and the crowning glory - a large scoop of green tea ice cream. A little pot of condensed milk is served alongside. I love the floral aroma of the green tea, the crunch of the almonds and, of course, that ever-so-fine ice. Brain freeze has never felt so good. What: The wasabi prawns and coffee pork ribs are excellent at chef Ang Song Kang's new restaurant, and even on a painfully hot day, I grit my teeth and order a soup because they are so nourishing. For dessert, I always have Coconut Jelly ($8.80) and I am that sort of desperate diner who reserves a couple of coconuts when making the reservation. 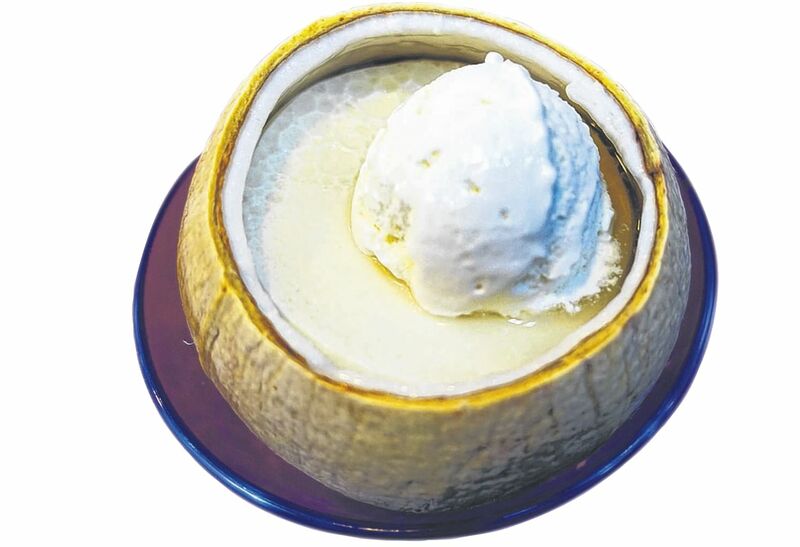 On a hot day, nothing is as cooling as coconut and there are four permutations of it in this dessert. At the bottom of the husk is a very wobbly jelly made with coconut water. On top of that is a rich jelly made with coconut milk. Neither layer is overly sweet so the natural taste of the fruit comes through in spades. A scoop of coconut ice cream sits pretty on top. After inhaling these three elements, I scrape the coconut flesh off the shell and roll out of the restaurant feeling happy and cool. What: Right off the bat, you know that this very ugly, very plain, very homely looking Homemade Nyonya Chendol ($1.50) is going to be good. The "worms", made out of rice flour, are not the radioactive green of chendol made in factories. Its pale green colour suggests freshly squeezed pandan juice and I appreciate the effort. Red beans, tender but not mushy, also go into the dessert. 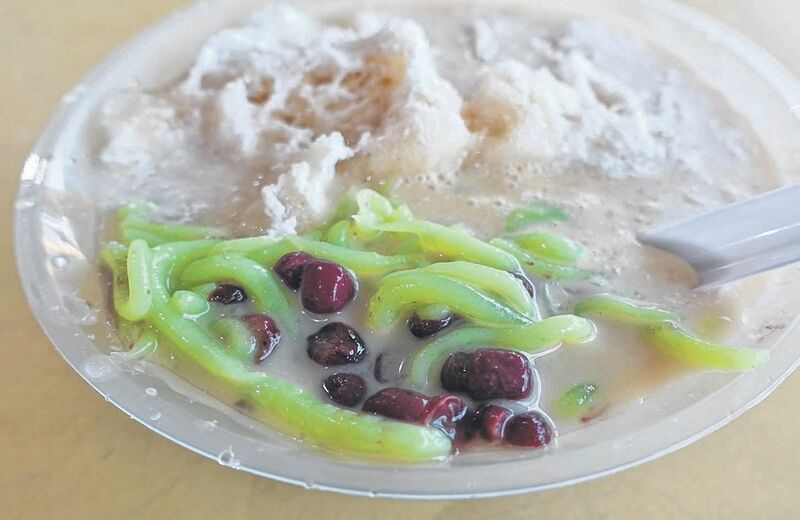 Then, the shower of shaved ice is drenched in gula melaka syrup and thin coconut milk. It is restrained: not too sweet, not too pimped out. But sometimes, simple and plain are enough. What: This Thai restaurant serves strong, milky Thai Iced Tea ($3) with lots of power and punch. Unlike many versions of cha yen served here, it is not too sweet. On my trips to Bangkok, I guzzle litres of the stuff because it is hotter over there than it is here. So on a hot day in Singapore, this iced tea really hits the spot. But there are two other excellent drinks to be had at Cafe Pal. 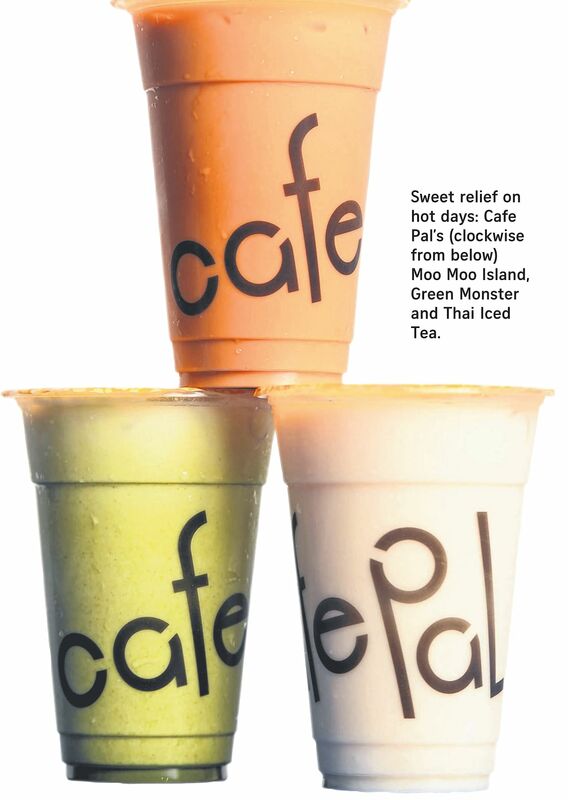 Moo Moo Island ($4.80) is green tea with milk and it is very aromatic. The lovely surprise: strips of tender coconut flesh, which give a good crunch. Green Monster ($4.80), with green tea, milk and matcha powder, is also a soothing drink on a scorching day. What: This traditional sweet soup is yet another balm for hot weather, and Four Seasons' version ($2) packs in lots of goodies. 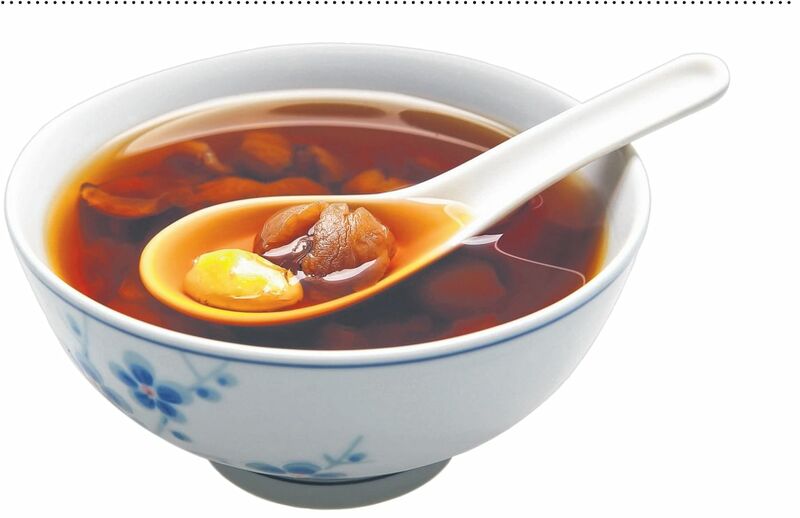 Dig your spoon in and you will find dried longans, white fungus, gingko nuts, strips of dried persimmon, pearl barley grains, lotus root, sago pearls and candied melon, among others. They swim in a soup that is not too sugary. To keep it from getting diluted, order the hot version then stick it in the fridge until it is well chilled. 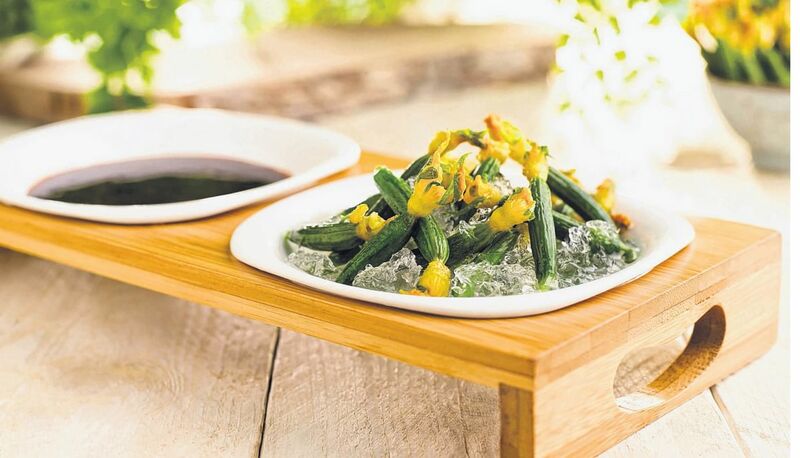 What: Like The Provision Shop, Putien, a Heng Hwa restaurant, has given some thought to the hot weather and come up with dishes to cool diners down. Iced Cucumber Seedlings ($6.90) are tiny little cucumbers with the flower attached. They have a gentle crunch and since they are about 90 per cent water, will help you stay hydrated. The baby cucumbers are served with an addictive, not-too-spicy dip made with chilli, garlic and the restaurant's secret sauce. For a drink, order Cooling Green Bean Drink ($3.50, left), a thick, warm drink. It is supposed to dispel heat from the body and can also be had cold. I think of it as a posh version of green bean soup.